Ever since I was little I’ve always been going against the grain. This mindset coaching article isn’t about me though. It’s about 99% of you won’t even follow this because everyone is trying to fit in not find their true self. When people gather into one spot, like a sporting event, there is a flow and order to getting inside. Next time you’re walking in be sure to pay attention to this. It’s like a herd of cattle. Without thinking about it they simply file in. That’s what life can feel like. Always doing the same routine. Because of that same routine, the changes seem so foreign. However, it doesn’t have to feel like that. It can be better and different every single day. 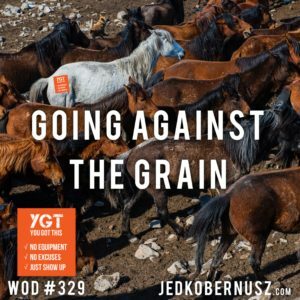 Going against the grain starts to feel like the new norm. When I was in college I use to lift weights and smoke cigarettes. That’s totally going against the grain. Quitting smoking was the hardest things to do, but very grateful I was able to. Chewing lots of sunflower seeds and packs and packs and packs of gum and boom, done. Also, once you decide to go against the grain or realize that you’ve always been doing so life gets fun. Because of the awareness, you’ll be able to stop trying to fit in and start living your life for exactly who you are. It’s been fun since I’ve always been 100% me. Once you feel like your true self, going against the grain will actually feel like a blessing. Others are out there and connecting with those people will feel so nice. There are actually way more of us than society realizes. Whenever you see someone smiling for no apparent reason, you know they’re going against the grain. Maybe they’re looking to learn something from you. That’s very normal too. Take it in and start teaching what you’ve learned about yourself. Working out without a rest day is totally going against the grain. It’s ok though. By now you know that muscle groups are never overused by design. So get that WOD done and reinforce your foundational mindset and skill set to match the true you. Time is one of those things that we don’t get back. Once you let go of all expectations whatever it is you want will happen for you. When will it happen is up to you. This mindset coaching article reminds you to focus on what you can control and forget about everything else. Life can get very crazy sometimes. When we operate from a place of stress the body becomes ill. As human beings, we have the ability to stay in stress without even having it in front of us. It can be in our minds as memory and send us through the roof every moment of every day. Letting go of all expectations for everything will change the physiological make-up of your body. Your operating systems will have a chance to cool off. As soon as you allow yourself to cool off that’s when it will happen. Your body and kind will find balance and you’ll find peace. Keeping that peace takes practice and perspective. If something bad happens simply understand that it might actually be good. Bad is only a perspective. Because people see something as bad we too take it on as bad. Winter can be long and a bad snowstorm might seem bad. The roof caving in on the shed might be seen as bad. It’s all about perspective. The way I see it is that snow is the weather. I don’t control the weather. The stuff in the shed can be replaced. I can only control myself. As long as I’m breathing everything past that is a win. There is a balance to life. Where there's bad, there is good. For example, we are in and out if that shed a few times a day. At least when it collapsed none of us were in it. Focusing on what you can control is when it will happen. Crossing the river of change is when it will happen. It, being whatever you’re working towards. Catastrophic events happen. Being prepared for them is great, but living in that state of mind only creates stress. That’s why I dedicate time for myself each day. The WODs are the perfect reminder that when I’m ready is when it will happen. Again, “it” is whatever I’ve been working on. Letting go of everything I want to happen is the way it comes to fruition even faster. Seems backward, but it’s true. Be ok with nothing happening and that’s when it will happen. Changes happen quick and slow depending on the situation. Everyone can see it before you can. At least the ones with depth can. 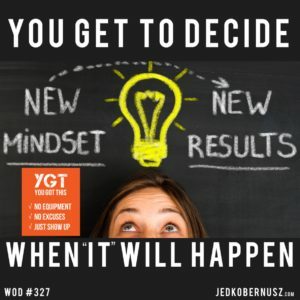 This mindset coaching article will increase your awareness of what’s happening in your life in case you’re ready to take the advice I’m about to give. If not, that’s ok too. What inspired this article is a movie called The Greatest Showman. The storyline actually surprised me because I didn’t think it would take a turn as it did. Seeing a ton of movies in my life I can usually guess what happens all the way through and others have no idea. I’m right because it’s the same storyline. Until this one came around. Since the inception of the 365 WOD Journey in 2015, I’ve been trying to help the world become a healthier place. It only dawned upon me at this very moment that I’ve only been trying to help myself become more than I am. It’s ok to be enough and love right where I am. The same goes for you. Everyone can see it before you can when disaster hits. There are certain patterns that are in our DNA. That makes up 50% of who we are. Accepting it only strengthens your will to live. Fighting it will only make the waters churn until they are barreling down onto you until you’re sunk and on the bottom of the sea. I’ve accepted myself. However, I still have moments where I don’t but I accept those moments too. When thinking about who is reading this I think of all the people who see the fitness world as vanity. Who cares what people look like on the outside. It’s what’s on the inside that counts. Being Part is the KoberNation is like none other. Everyone is accepted. Whether you’re big or small or strong or weak, it matters none. Just like on the Greatest Showman, the more curious you are the closer you are to being the truest you. My One Word for 2019 is Accept. I accept my life for what it is in every aspect. Since I’ve done that it has been very unexpectedly joyous. I invite you to do the same. Your One Word will find you when you’re not looking for it. That’s how it works. I surrender myself every single day to my heart and Higher Power. In the form of words, writing, and action. It’s now your turn. Everyone can see it before you Can because they are waiting for you to show up to your truest potential. I believe in you. Now it’s your turn to start believing in yourself. Let’s count how many actual holidays you take each year and on those days you will most likely eat way more than you normally do. 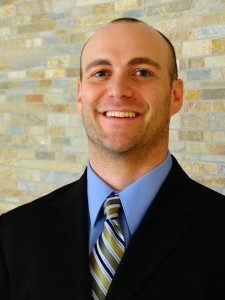 This mindset coaching piece will provide some insight on cheat days gone wrong. Every day of the year can be a holiday if you if you let them be. From major holidays to coworker birthdays. When we link emotions to events in life and give them an emotional bond it creates a memory. Then we give it a food source aka birthday cake or ice cream. The emotional tie we give to food provides those cheat days gone wrong. When we see the advertising for food there are certain emotional triggers that need to be turned on. Happiness is the end result of the emotional trigger. At the beginning of any advertisement, they all pose a problem and give it some dramatical story. Then they let you in on the first thing they noticed and how they feel after they eat or drink whatever they're selling. After they've roped you in on their product they show you how they've been doing and give you the best part of it all. Then comes the cheat days gone wrong. It could be one day or many days tied together. Because you saw that advertisement you couldn't stop thinking about how delicious the cookies would taste. Therefore your list of healthy foods for the week then have the ingredients for cookies. Now, don't get me wrong, I'm all about cookies, cake and ice cream, but it has to have its place and time. 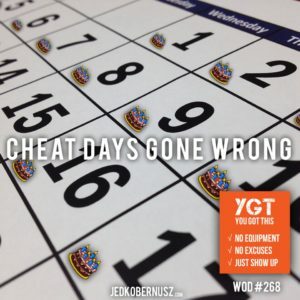 Why Do You Get To Cheat Days Gone Wrong? Because of social media, we get notifications on when it's someone's Birthday. That alone is an everyday occurrence with me. So if I wanted to I would be doing out to dinner and/or drinks or even baking for these friends. That can get very calorie dense if you see where this is going. You don't have to eat and drink all of the things just because it is a “holiday”. I worked at a window manufacturing plant that had an average employment of 58 years old. The age is important here because they had at least one retirement party happening a day in that plant. They served cake and ice cream at every single one of them. So as an employee you could literally go and get cake and ice cream once or twice a day. None of us allow for that kind of caloric intake. Not even the Minnesota Vikings or whatever sports team you cheer for. It's time you started to ask yourself why you need those foods at that very moment. What is it that flipped your trigger? Cheat days are necessary at the beginning of any new lifestyle, but eventually, you'll get to the point where you won't need a cheat anything. When you can see food as an energy source for your body and not have an emotional tie you definitely have broken free from the societal chains of food intake. That's why the slow and steady mindset wins every time. Now, with this knowledge comes to practice. Each day you'll be faced with a “holiday” if you let it. Simply stopping and taking a moment to visualize the process of eating what it is you're about to eat and think of the amount of emptiness that will be there afterward. It may not be an emptiness that you're feeling, but being aware of what emotion you feel will help you interrupt your patterns to create new ones. Let's get to the moving part and afterward start thinking about what kind of holidays lead to cheat days gone wrong. PSS: If you found this WOD provided value, then consider giving an At-Will Offering. Because then I can keep helping. Go Here To Give. Thank you for your time, attention and generosity. If you have any suggestions or any questions for me with this post or want to know more about my services, then please email me at [email protected]. There's nothing that pisses me off more than mean people. Each time I have someone new come to my YGT Fitness Class I always tell them that they can either be nice or go home. Nobody's got time for a crappy attitude and a salty outlook on life. However, sometimes all it takes is an interruption to shake off that salty outlook. My suggestions for that interruption would be to come in and get your sweat on at the YGT Fitness Class in Roseau MN. Not everyone is within the vicinity of the town that the YGT Fitness Classes are being held and I'm totally aware of that. You have options though because of this little thing called THE INTERNET. You can join us via video chat or simply set your clock and be there in spirit. Working out at the same time as the group still counts. That might sound a little coo coo for coco puffs and I'm good with that. It's because if you're reading this, chances are you're in alignment with my work. If you see this as some random dude who's crazy, you're not in alignment with me and that's for good reason. The first time someone comes to my YGT Fitness Class they feel very out of place because every other class or gym has made them feel like that in one way or another. I'm saying I'm perfect because no one is, but in past experiences, I've kicked people out of my class before. I can spot it from a mile away. Someone is judging their neighbor for grabbing the ten-pound weights instead of the fifteens. I politely walk over to them and have asked them to leave. Now, my business sense was telling me not to, but my heart and conscience said to get the jerk out here. The person did leave and never returned to my class. I'm good with that because the person who was being judged came up to me and said thank you. That person didn't want to cause trouble but probably wouldn't have come back to my class if I hadn't done that. I would rather have the person who works their tail off in a nice way than have someone judge every for what they think is hard work. Only you can tell yourself if you're working hard or not. Being honest with yourself is something most people aren't though. It's ok. No Shame, No Blame. that's a big one when it comes to loving yourself. The Be Nice Or Go Home rule doesn't only apply to other people. It applies to ourselves too. Be nice to yourself or go home. What I mean by “go home” is to stop everything you're doing and reflect on how you treat yourself. Really get to know your self-talk and self-awareness. 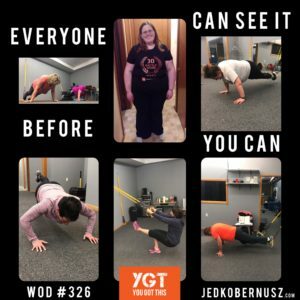 After the first YGT Fitness Class, most people are hooked because of the friendly, welcoming, encouraging, and consistent community that keeps showing up. We even have a group Facebook Chat that we pump each other up when we are feeling down. I say we because I'm not outside of crappy times. Notice I said times and not day. We can choose to have a crappy MOMENT or a crappy DAY. Be Nice Or Go Home remember? Keep your mind in check by stopping everything and notice how you feel. Then, ask yourself if this feeling is serving you or not. If not, then love it and let it go. Next, store that event in your soul as wisdom. 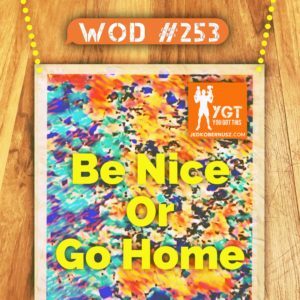 People leave the YGT Fitness Class loving the Be Nice Or Go Home mentality because they feel better after working out. Every movement is modifiable. We are all on different levels of fitness and health. Coming together in person, video chat or mentally is a powerful happening. A loving community is something that doesn't come easy and that's what I cherish most about the #Kobernation. Let it be known that haters are going to hate. That's what they do, but they are NOT welcome in my class. Try everything one (Within reason right? LOL) and if you like it keep doing it. The first YGT Fitness Class is free because just showing up is a BIG part of your results. If you don't like it, it's ok. No harm, no foul. It takes guts to even try something new. Whether you try the YGT Fitness Class or anything else for the first time Be Nice Or Go Home. So the next time you see someone not being nice, call them out on it and ask them to leave. The world needs leaders like you because as soon as you show up to your fullest potential you go from being a follower to leader. PSS: If you found this WOD about how I follow the simple rule to be nice or go home, consider contributing to the WOD fund so I can build my gym. Because then I can keep helping you out. Go Here To Contribute. Thank you for your time, attention and generosity. Did you enjoy this post about talking about how I follow the simple rule to be nice or go home? Please share and/or comment. below.